Chronic obstructive pulmonary disease (COPD) is a long-term lung condition which causes you to feel breathless. It includes both chronic bronchitis and emphysema. It’s thought that there are around 1.2 million people in the UK who have been diagnosed and are living with COPD. However, it’s likely that there are more people who haven’t yet been diagnosed. If you’ve been told that you have COPD, you have a long-term condition that blocks the passage of air into your lungs. It’s an umbrella term that covers several different types of lung damage, the commonest being chronic bronchitis and emphysema. You’re more likely to have COPD if you’re over 65 and have smoked for a long time. Chronic bronchitis is caused by inflammation of your bronchi. These are the main airways that lead from your windpipe (trachea) to your lungs. This inflammation can lead to excess mucus that may block your airways. Emphysema is caused by damage to the air sacs at the end of the smallest tubes of the lungs (the bronchioles). These tiny air sacs or ‘alveoli’ are where oxygen moves from the lungs into the blood. Damage to your lungs means that there’s less oxygen available to pass into your blood and it’s more difficult to get rid of carbon dioxide. This can affect all your body tissues, including your brain. So, as well as being breathless, you may have other symptoms such as feeling tired. COPD is a long-term condition that usually gets worse slowly over time. At first, you may not have any symptoms or they may be very mild. You may have either a persistent, phlegmy cough or breathlessness. Many people don’t see their GP at this early stage, but the earlier you get advice and treatment the better. These symptoms can be caused by a number of different conditions and aren’t always caused by COPD. Whatever the cause, it’s important to see your GP. Most illnesses are easier to treat if they are caught early. It isn’t usual to get chest pains or cough up blood if you have COPD. If this happens, it’s important to see or speak to your GP immediately. Your GP will ask about your symptoms and examine you. They’ll ask if you smoke (or used to) and about other factors that could increase your risk of COPD, such as exposure to dust or fumes at work. Your GP may listen to your chest with a stethoscope to see if you have any wheezing or crackling sounds when you breathe. If you have any symptoms of COPD, your GP will ask you to have a spirometry test. This measures how well your lungs are working. You blow into a small meter (called a spirometer) with a mouthpiece as hard as you can and then for as long as you can. This tells the GP how much air your lungs can hold and how much of it you can force out quickly. The GP may ask you to repeat the test after inhaling a medicine that relaxes the small tubes inside your lungs. You may also have a peak flow test, using a tube that has a scale and a movable marker. You blow into the mouthpiece as hard as you can and the marker moves up the scale. This measures the maximum force you can muster when breathing out. These tests help to tell COPD from asthma. Unfortunately, it isn’t possible to cure COPD and damage to your lungs can’t be reversed. So the aim of any treatment is to manage your symptoms, help you feel as well as possible and try to stop the COPD from getting worse. You may be able to manage your condition yourself for a while. The most important thing you can do is to stop smoking. Giving up smoking can relieve your symptoms and slow down the development of chronic obstructive pulmonary disorder (COPD), even if you have had it for a long time. If you still smoke, speak to your GP about getting help to stop. There are other steps you can take to try to prevent COPD from getting worse and to ease your symptoms. Some examples are listed below. Make sure you drink enough. This can help reduce the thickness of mucus that your lungs produce. Try to exercise regularly. You should aim to go for a walk for between 20 to 30 minutes, three to four times per week. When you exercise you should feel a little bit out of breath. But don’t overexert yourself and always take things at your own pace. If you can’t move around, exercise by stretching out your arms and twisting your upper body. Make sure you eat a healthy, balanced diet. COPD can cause you to lose weight and your body may start to lack certain nutrients. Make sure you eat enough fruit and vegetables, oily fish such as salmon, mackerel or fresh tuna, and dairy products such as milk cheese and yoghurt. Your GP may recommend that you take nutritional supplements. Being overweight may also affect your COPD. For more information, talk to your GP – they may refer you to a specialist for advice on your diet. Make sure you have all recommended vaccinations, including an annual flu jab and vaccine against pneumonia (Streptococcus pneumoniae bacterium). Feeling breathless can be frightening at times. If you panic, it can make you more breathless. Speak to your GP or physiotherapist about learning and practising ways to control your breathing. For more information, see our FAQ on managing breathlessness below. There are a number of treatment options to help manage your symptoms. Which treatments you’re offered will depend on your particular situation and symptoms. Your doctor will discuss these with you and help to make sure you get the treatment that is best for you. Pulmonary rehabilitation aims to reduce your symptoms and help you to manage your condition. Sessions are usually twice a week for at least six weeks. Ask your GP if there’s a programme in your area. If you have a flare-up of COPD that causes you to be admitted to hospital, you should be offered a pulmonary rehabilitation course within four weeks of being discharged. There are various medicines that may help to ease symptoms or control flare-ups. Discuss with your GP which medicine is best for you. You may be advised to take more than one. Some of these medicines are also used to treat asthma. 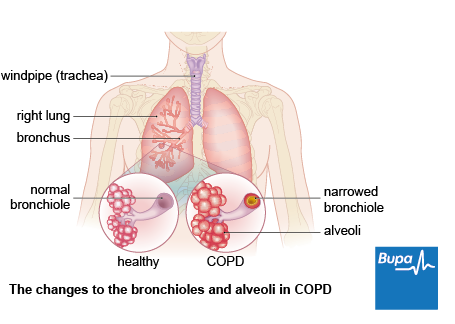 These medicines are commonly used to treat COPD. They widen your airways so air flows more easily and can relieve wheezing and breathlessness. You usually have them through an inhaler. To start with, you’ll probably have a short-acting bronchodilator. If you find you use this a lot throughout the day, your GP may switch you to a long-acting form that you use once or twice a day. This will make life a bit easier, but is also better for managing your condition because it gives you the dose you need steadily throughout the day. There are many different types of bronchodilators. The two main types are called beta 2 agonists and antimuscarinics. Examples include formoterol (a long-acting beta 2 agonist) and tiotropium (an antimuscarinic bronchodilator). It’s very important that you learn to use your inhalers properly so that you get the correct dose of medicines into your lungs. MDIs (meter dose inhalers) are the standard type of inhaler used. You press the top of the inhaler, which releases the medicine in a short sharp puff. Others include breath-activated inhalers, which release the medicine when you breathe in. Inhaling the right dose can be quite tricky at first, but will become easier with a little practice. Your GP or practice nurse will show you how to do it. If you can’t manage, they may suggest using a ‘spacer’. This is a plastic bubble with a mouthpiece. You spray the MDI inhaler into it and then breathe the medicine in from there. If your breathlessness is severe and stops you going about your daily life, your doctor may assess you to see if using a nebuliser might help. This is a small machine (about the size of a briefcase) that turns liquid medicine into an aerosol. You can then breathe it in through a mouthpiece or mask. If your doctor thinks it would help, they may suggest getting a nebuliser that you can use at home. Steroid medicines (also known as corticosteroids) may help if you have more severe COPD. They help to reduce inflammation in your airways. Generally, if you need steroids regularly, you have a small dose via an inhaler. If you have a flare-up of COPD, your doctor may suggest a short course of steroid tablets. You only take these for a limited amount of time because they can cause side-effects. If you’re used to managing your COPD, your GP may give you a course of steroid tablets to keep at home, so that you can start them as soon as you recognise the signs of a flare-up. Mucolytics break down the phlegm and mucus produced by your lungs, making it easier for you to cough it up. Your GP may advise you to take a mucolytic if you develop a persistent, phlegm-producing cough. This will help you feel better, but also helps to stop flare-ups of COPD. You’ll only need antibiotics if you get a bacterial chest infection on top of your COPD. Your GP may give you a course to keep at home so you can start them as soon as you realise you’ve got an infection. You may have oxygen in hospital if you have a bad flare-up of your COPD. Some people also have it as a long-term treatment at home. When you see your GP or specialist, they’ll check your blood oxygen level by putting a clip on your finger. If this falls too low, they may suggest oxygen therapy. Before you have this prescribed long term, the doctor will check your oxygen levels with two blood tests that are at least three weeks apart. Long-term oxygen therapy can help to relieve your symptoms. It works best if you use it for at least 15 hours a day. You inhale oxygen through a mask or small tubes that sit beneath your nostrils (nasal cannulae). You may have oxygen cylinders delivered to you at home, including smaller, portable versions you can use when you go out. Or you may have an oxygen concentrator. This is a machine that filters oxygen from the air in the environment and stores it for you to use. You must not smoke if you have oxygen therapy because there is a serious fire risk. You may not be prescribed oxygen therapy if you haven’t given up smoking. If you travel by air, you may need additional oxygen because of the lower pressure inside the aircraft. It’s important to speak to your specialist doctor if you have COPD and are considering travelling by plane. It is only possible to carry out these operations in certain circumstances. Most people with COPD are not well enough to have these treatments – for more advice, speak to your doctor. It may be possible to do a new type of surgery, which involves putting a camera into your lung and placing valves or coils into the damaged area. This aims to reduce the amount of air that flows to the damaged parts of your lungs, and so increase the amount that flows to the healthier parts. As this type of treatment is fairly new, it’s not fully known how effective or safe it is. For more information and to find out if it might be suitable for you, talk to your doctor. The biggest single cause of COPD is smoking. The vast majority of people with COPD are smokers or ex-smokers – but if you stop smoking, your risk of developing COPD begins to fall. If you smoke, the impact of these other risk factors is increased. It’s very difficult to gauge the impact of these causes on non-smokers. A recent study estimates that passive smoking could increase risk of COPD by about two-thirds. However, it is important to remember that COPD is rare in non-smokers so the risk is not as great as it sounds. A rare cause is an inherited gene fault that leads to lower than normal levels of a protein called alpha-1 antitrypsin. As this protein helps to protect your lungs, a shortage of it can increase your risk of COPD. You have the best chance of preventing COPD if you don’t smoke. If your job exposes you to dust or fumes, it’s important to take care at work and always use protective equipment provided, such as face masks. Are asthma and COPD the same? Are asthma and COPD the same? No, but they do cause similar symptoms. The main difference, is that asthma symptoms usually come and go, whereas COPD tends to be irreversible and the symptoms are persistent. If you have asthma, your airways become irritated and inflamed at certain times, for example, if you’re exposed to dust or when exercising. This causes them to narrow, which makes it more difficult for you to breathe. However, if you have COPD, the inflammation in your airways is permanent and therefore your symptoms are constant. COPD usually develops in people over the age of 40, whereas asthma often starts in childhood. The most common cause of COPD is smoking, but you’re also at a slightly increased risk if you have asthma. You’re more likely to get breathlessness and wheezing that wakes you at night if you have asthma. You may find you get a chronic cough and produce more mucus if you have COPD. Speak to your GP if you’re concerned that you have symptoms of asthma or COPD. There are simple tests you can have to tell the difference. See our Diagnosis section for more information. How can I better manage my breathlessness? How can I better manage my breathlessness? Breathlessness can be frightening, but there are techniques you can learn to help manage it. Some are designed for you to do regularly to try and improve your breathing overall and ability to exercise. Others are designed to help you get your breathing under control and keep calm when you’re feeling particularly short of breath. Some techniques are simple to learn, such as breathing through pursed lips as if you were whistling. Others take a bit more practice. There’s a lot of information available online or in booklets. However, it’s often better to have someone show you, so speak to your physiotherapist who should be able to help. More generally, exercising as much as you are able will help your breathing overall. Even a short daily walk will help. Swimming is known to be good for regulating breathing if you are well enough for that. There’s increasing evidence that singing can help to improve breathing. In research it has been shown to increase lung capacity, help people feel better, reduce anxiety, and can also help with shortness of breath. Some centres now run singing workshops for people with lung conditions, including COPD. The Royal Brompton Hospital has produced a CD for those who can’t get to a group, which is available from their website. Or you could look for a local choir. Many don’t have auditions and singing in a group can be more fun and help you to feel less isolated. Being diagnosed with a condition can be stressful and worrying.